Police throughout Britain held two minutes of silence to commemorate the deaths of two French officers killed in Wednesday’s terror attack on the satirical magazine Charlie Hebdo. Ahmed Merabet, 42, and Franck Brinsolaro, 49, were among 12 people killed in the Paris attack. Four prominent cartoonists were also killed, together with the magazine’s editor-in-chief, Stéphane Charbonnier. Ceremonies took place at 10.30am on Thursday, exactly 24 hours after the attack took place. The Association of Chief Police Officers (ACPO) and the Police Federation of England and Wales (PFEW) asked forces throughout the country to take part. In a statement, ACPO vice president Sir Peter Fahy expressed his shock at the terrorist attack, saying the officers died protecting freedom of speech. “They knew the risks they were facing in carrying out their duty and clearly showed great bravery in trying to prevent the terrorists murdering others. We stand in solidarity and express our great sympathy for their families and friends,” he said. Merabet, who worked with the bicycle unit of a local police station, was on patrol when he encountered the shooting. A video from the scene of the massacre shows his death in disturbing clarity. 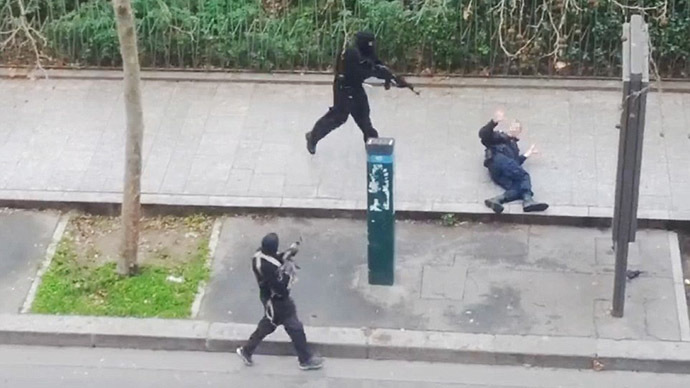 The Muslim officer lies wounded on the pavement as the gunmen approach him with their weapons. The gunman answers, “OK chief,” before shooting Merabet in the head with his Kalashnikov. Franck Brinsolaro, a brigadier and protection officer for the magazine’s editor-in-chief Charbonnier, was the second officer killed in the attack, which left a total of 12 people dead. Brinsolaro was in the editorial room when the gunmen burst in. A police union spokesman said Charbonnier had received even more death threats than usual in recent days. The UK government’s Cobra emergency committee held a meeting on Thursday to discuss the Paris attacks. Security in London has been raised overnight, with armed police patrolling the streets around Westminster. Police are also understood to have visited the offices of at least one magazine, which has previously published articles about radical Islam. The magazine was reportedly told to lock their doors and call the police as soon as they experienced any trouble.